Statistics mean that you calculate and measure different things. There are, for example, population statistics which examine how many people there are in a country, how many are men and how many are women, which ages they have, where they live, the number of children they have, etc. There are also statistics about many other things, like for example companies and commerce and how people vote in elections etc. With the right statistics you can compare things to each other and find out a lot which might not otherwise be so clear. Statistics are often used to make decisions in large and small questions. Politicians, businessmen and scientists work a lot with statistics in what they do. Statistics are a part of mathematics. 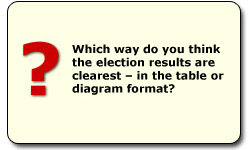 Statistical surveys are often presented in the form of tables and diagrams. To be able to read and interpret tables and diagrams has become more important in our everyday lives. Everywhere you see tables and diagrams. Many articles in newspapers and reports on TV include information and messages in the form of tables and diagrams which you need to be able to interpret and make conclusions about. When you are out travelling a while information about buses/trains/flight departures and arrivals/delays etc are on a sign or monitor which is similar to a table. Many times diagrams are used to explain tables. A clear example is when you report the election results. Here you see the results in table form. Here are the same results in the forum of a diagram.